What happens when rodeo riders no longer want to rough up their bodies on the competitive circuit? John and Taunia Ellick bought a ranch so they could continue to ride—and teach others appreciation for the cowboy way of life. Attorneys by vocation, they also raise cutting horses and run Texas Ranch Life, their working ranch and luxury bed and breakfast near Brenham, Texas. When guests are on premises, John loves to mount his favorite steed Tommy and give visitors a demonstration of true cowboy riding skill in his corral. 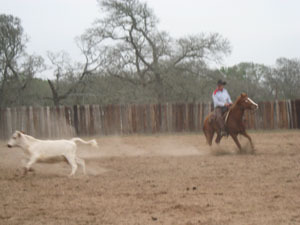 Deftly leading his horse near a group of heifers, he cuts back and forth through the dust, separating calves from the herd. A good cutting horse has a “big stop,” meaning he can rein in quickly and change direction on a dime, John says. “I try to anticipate moves, but the horse makes many moves on his own,” he adds. “Then I try to reinforce what the horse has already done.” Stop. Go straight. Turn around. Go the other way. “It’s all about communicating with the horse,” John explains. I’m sitting on the bleachers watching the presentation with other guests. Although it’s for fun this time, the techniques are really about business. The skills demonstrated were a necessary part of life on a ranch in Old West days. “Cutting” is how certain calves were culled for branding, breeding, medical care, and other reasons. The next day John saddles up several horses, so our group can ride on the open range with him. “Horsemanship is a partnership between horse and rider, but the rider is the leader,” he emphasizes. He teaches us how to mount properly and to sit in the saddle with shoulders, hips, and heels all aligned. “The horse feels every move you make. If the person riding is unbalanced, the horse feels it,” he says. I sit tall on a tan horse named Pal as we ride around a portion of the 250 acres that comprise this part of Texas Ranch Life. We traverse streams, dodge low hanging branches, and try to keep our distance from the horse in front so we won’t get splattered with mud. And we learn a bit of cowboy etiquette: Never ask how many head of cattle or how many acres a rancher has. 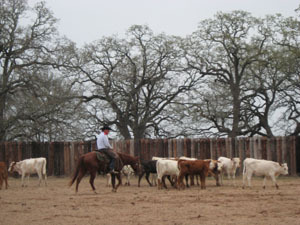 If guests are game, they can participate in actual ranch activities. 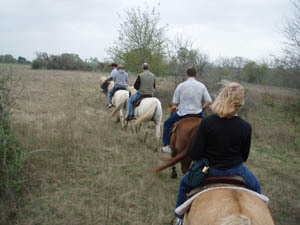 Other options are hiking, fishing, or relaxing in actual 1800s cabins restored and renovated in authentic Texas style. Contact Texas Ranch Life to set up your Old West getaway.